We have put considerable effort into identifying and testing the best technology available for building computer-controlled models with K'NEX. We also offer a range of accessories for use with Learn & Go and/or FlowGo, as shown below. 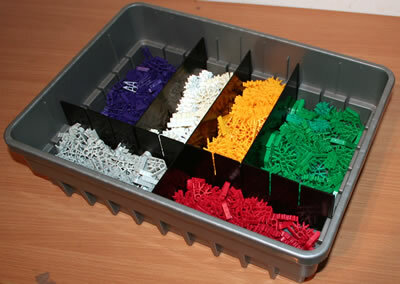 Click here to view some examples of KNEX models using computer control. The prices below exclude VAT (Value Added Tax). Please click on any image to view more details. Learn & Go is a neat, cost-effective device that allows you to control up to 2 K'NEX control motors. Children as young as 6 can use Learn & Go to record and then play back a simple sequence of motor commands, such as "motor 1 clockwise" and "motor 2 anticlockwise", in a K'NEX model such as a Theme Park ride. 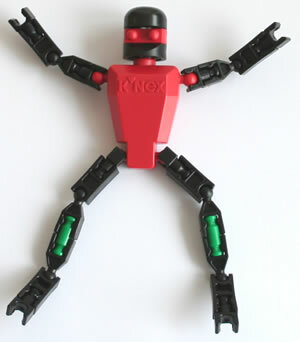 From age 8, children can then build and program more sophisticated K'NEX models, such as the Dancing Robot. If you buy your Learn & Go from us, it is supplied with a battery holder, which requires 4 x C batteries (not supplied). The battery holder is strongly recommended if you plan to use your Learn & Go with K'NEX control motors. Please visit the Data Harvest website to find where to buy FlowGo. FlowGo is an exciting computer control interface, which can be used to control motors, lights and sensors in K'NEX models, giving learners an insight into systems and how they are created and controlled. ♦ 6 Output sockets for 6v bulbs, buzzers, LEDs etc. Two Analogue Inputs are also provided via 3.5mm jack sockets, for temperature and light sensors, if required. Flowgo requires software for operation, such as the Go Control software. Forwards, backwards, turn, spin - teach the robot the dance moves, and it will repeat them - again and again and again. The K'NEX Dancing Robot kit includes 2 x K'NEX Control Motor, and all the K'NEX parts needed to build the robot. 2. Egg-Box computer control box, with a battery holder and 4 x "C" batteries. If you buy your Learn & Go from us, you will receive a free 4 x "C" battery holder. The instructions for this kit are provided in the form of a downloadable .PDF document, containing step-by-step instructions and photos for assembling the model. Kit to build a simple K'NEX Theme Park ride, and then record any sequence you like of forwards and backwards motion, with lights going on and off. Amaze your friends! 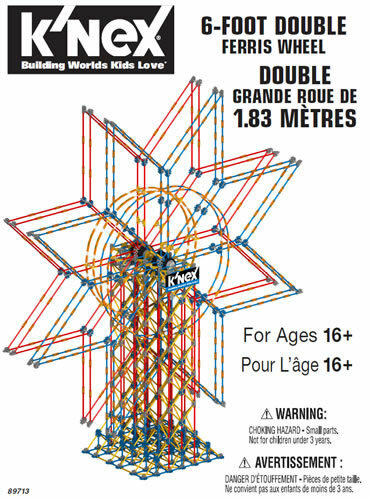 The kit includes a K'NEX Control Motor, two bright LED lights on leads with connector plugs, and all the K'NEX parts needed to build the ride. 1. Learn & Go control box. This fascinating computer-controlled bridge can be operated by any K'NEX computer control device. The bridge can be programmed to open and close via a K'NEX control motor. The kit includes the control motor, and all the parts needed to build the bridge. A set of 6 coloured LEDs (2 red, 2 amber and 2 green) attached to 1 metre of ribbon cable with colour coded 4 mm plugs. Ready to connect as an Output on Learn & Go or FlowGo. The LEDs may be separated into three sets of two LEDs each if required.